Some of these are actually sitting on my shelves and some are on my mental list, waiting to be purchased or checked out, depending on the relative levels of my patience and my budget. The idea is sort of an annotated TBR for myself (to help with the “now WHY was I thinking I wanted to read this…?”), with links to the reviews and reviewers most responsible for fueling the out-of-control growth of my reading aspirations. HILD by Nicola Griffith reviewed by Natalie over at Radish Reviews A historical novel that shatters conventional wisdom about the lives of ordinary women is based on the life of a medieval saint who lived at the court of King Edwin in 7th centrury England? With strong female communities plus a focus on material culture (textiles and tapestries)? Yay! Back in my own Dark Ages (college) I studied English medieval architecture, and even read me some Venerable Bede, and I still harbor a lingering fascination with the “strange but true” tales of anchoresses and abbesses and other female acts of virtue (or vice) deemed important enough to find their way into the written record. Natalie has mentioned this book on twitter often enough that it’s pretty much topping my wishlist right now. And then there’s the reviewer at NPR who says this book shatters the myth that women of the middle ages were too oppressed to make interesting subject matter for historians. I’m curious to see for myself how this work of meticulously researched historical fiction might “read” like fantasy. For some reason I want Hild to look and act a little bit like Brienne of Tarth from Game of Thrones, but since I haven’t read this book yet I should probably refrain from ‘dream casting’. 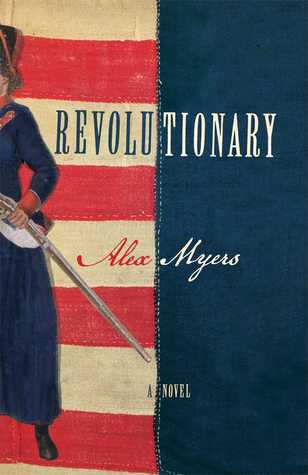 REVOLUTIONARY by Alex Myers I am eager to read this not because of a particular review, but because once I saw it reviewed a couple of places, it just sounded like a book I need to read. RevWar history is one of my side obsessions. I live less than a mile from the path Paul Revere’s horse trod out to Lexington on April 19th, 1775 and last summer I tracked down the grave (in Blacksburg, Virginia) of an ancestor who served as a private in a Maryland regiment and, according to family lore, witnessed the surrender of the British at Yorktown. This novel tells the story of Deborah Sampson, a woman who hid her gender and fought as a man in the American Revolution. Alex Myers himself has experience living both male and female lives; he was recently interviewed by The Daily Beast about the book, and his life as a female-to-male transgender person. Of course this seems to be a big part of the buzz around this book, but it’s really not the main reason I’m interested in reading it. I am always on the hunt for a well-told Revolutionary tale and I’m hoping this one will soon have a place of honor on my Best Of Minutemen shelf. ANCILLARY JUSTICE by Ann Leckie reviewed by Janine Ballard at Dear Author This is pretty far outside my usual territory, but Janine’s review grabbed my attention since she loved it so much and I consider her the right kind of tough critic. Also, she’s read Outlander and is willing to entertain a deconstructionist conversation about whether or not it’s a romance, so when she talks about falling “headlong” into a novel it makes me think something pretty interesting must be going on. So even though this is science fiction, and the protagonist is an artificial intelligence who may or may not be female, it sounds like this is a novel about relationships, loyalties, and the construction of gender, and I am happy to have a hold request for this book pending at my library. 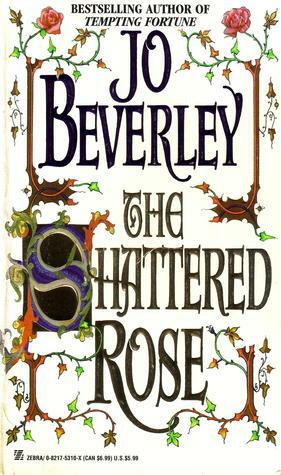 THE SHATTERED ROSE by Jo Beverley I’ve been thinking a lot about JoBev recently, thanks partly to Janet Webb, who is a fellow appreciator and fans the flames of my Malloren/Rogues obsessions. I’ve read nearly all of Beverley’s canon, but none of the medievals. When I posted about Lucien hitting Beth in An Unwilling Bride, the ensuing discussion revealed that The Shattered Rose also involves jealous anger and violence between hero and heroine. Because Beverley can always be counted on to be challenging, even in the context of an engaging and absorbing romance, I’m very curious to see how this plays out in a medieval setting, especially with the story told from the hero’s POV. A brief review and summary are here, at The Romance Reader. THE OUTCASTS by Kathleen Kent I just feel like reading something western. Also, Kent is the author of The Traitor’s Wife and The Heretic’s Daughter, both of which rank among the most beautiful and haunting historical novels I’ve read in decades. Possibly ever. Set in and around Puritan Andover and Salem in the years prior to the witch hunts, the former is so achingly romantic I reviewed it as a romance even though it is so not a Happy Ever After story. It was a beautiful HFN, though. Sigh. But on to Texas, and a book that sounds possibly even more menacing — a ruthless prostitute on the run from the law (after escaping from a brothel where she was a virtual prisoner). In the Salem novels Kent’s portrayal of frontier justice and hard women chafing in the cages society places around them was breaththaking and I found I quite liked her female protagonists’ rough edges. Since the Dallas Morning News did not seem to like her very much, I’m very curious about Lucinda, and what happens when she runs into a Texas Ranger tracking a murderer. I’m a little afraid I may not like her, I’m not sure it’s going to be romantic, and I’m definitely not betting on an HEA, but I am definitely going to read this book. In fact, several of these books are making me think about female characters who are unsympathetic in one way or another. Since I haven’t yet read them, I can’t speak to their likeability but sometimes unlikeable heroines are actually my favorite kind. This entry was posted in Reviewers, Writers and tagged Alex Myers, Ancillary Justice, Ann Leckie, book reviews, construction of gender, Hild, historical fiction, historical romance, Jo Beverley, Kathleen Kent, Nicola Griffith, regency romance, Revolutionary, romance fiction, romance novels, romance reviews, TBR, The Outcasts, The Shattered Rose, unlikeable heroines. Greetings! Miss B. has HILD, thanks also to Natalie’s review at The Radish, on her desk awaiting a nice vacation time to be tackled. It’s a brick! It does look like a book you really want to sink into, and not try to read in short snatches of time! Girl, you just gave me homework on a Sunday night! Tracking down each title right now. Walking Dead can wait. I definitely want to hear what you think when/if you read Ancillary Justice and/or Revolutionary! 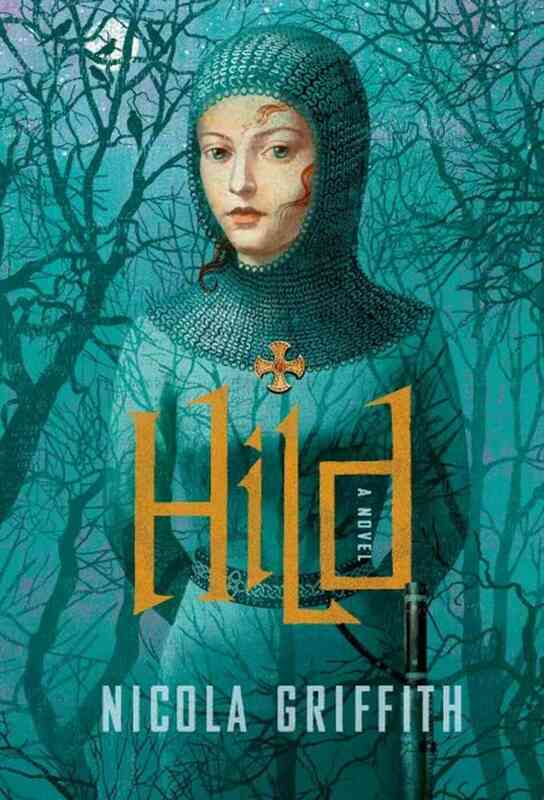 Very, very intrigued by Hild now, and you’ve also succeeded in planting Brienne of Tarth in my head, before I even got to see an actual copy of the book. I’ll look for this one, thank you! Also: What a wonderful idea—too many of my books are gathering dust on my shelves, and I bought nearly every one of them because it seemed very urgent at the time. I think I should try my hand at this, if only to confront the TBR Mountain. I hope the Brienne image doesn’t end up being a downer, for either of us, when we actually get to reading Hild! She just popped into my head when I was re-reading the reviews, but my mental images of characters tend to be quite fluid. Writing the “annotations” for books not yet read is kind of a funny exercise, but it does push me to whittle the list down a bit because sometimes I find out a book isn’t as urgent as I thought at the time. On the other hand, I could just as easily put the time into actually reading some of them! 🙂 Many thanks for visiting and commenting. Thanks for some provocative suggestions as always. Where would you recommend I start with Jo Beverley? Hmmm, JoBev has been much discussed in my tweetstream lately! Most seem to agree it’s better to read in order, which would argue for starting at the beginning of one of the series — either Mallorens (Georgian-set) or Rogues (Regency). I can’t remember if you are partial to medievals, but there are several which people really love/admire, though I haven’t read them. I’d say if you are a read-in-order kind of person who doesn’t want to meet couples out of sequence with their own novels, you could start with the first Malloren book, My Lady Notorious. I hesitate to recommend starting with book one of Rogues because it’s got a very challenging theme and, arguably, flawed hero who some readers really don’t like (I myself find these challenging aspects of Beverley are what make her books so compelling, but I do think An Arranged Marriage and An Unwilling Bride, the first two Rogues books, are especially challenging). Also, the Malloren series is really my favorite – I like the baroque Georgian world. If you haven’t already, check out Janet’s column about JoBev and/or this lively debate about her problematic heroes which Keira managed to capture from twitter. My favorite Malloren may be Lady Elfled’s story, Something Wicked, and I do love Skylark, from the Rogues series, which is actually the very first JoBev book I ever read — completely random and out of order! I like medievals, but I’m always braced for an anachronistic heroine, which can make for a less than relaxing read. I’ll check out the Mallorens….and maybe not read the blogs until after in case of spoilers. Recently read and enjoyed Not Quite A Husband, which I see you also enjoyed, as I pick my way along Dear Author’s Top 100 Romances. I hope you read and enjoy HILD soon. It’s great! I don’t know if she’s like Brienne but she’s cagey and smart and unforgettable.